The Moon takes care of daily events more than large picture events. The Moon in astrology is the most changing but also impressionable of all of the planets (including the sun and moon). Depending on your Moon sign also known as Rashi in Vedic astrology, it is likely that you will be more indecisive that day and even may change your plans several times before deciding what you want to do. Let’s find out how the moon in signs placement in our horoscope can influence our day-to-day activities. Aries are not heavily dictated by the moon. 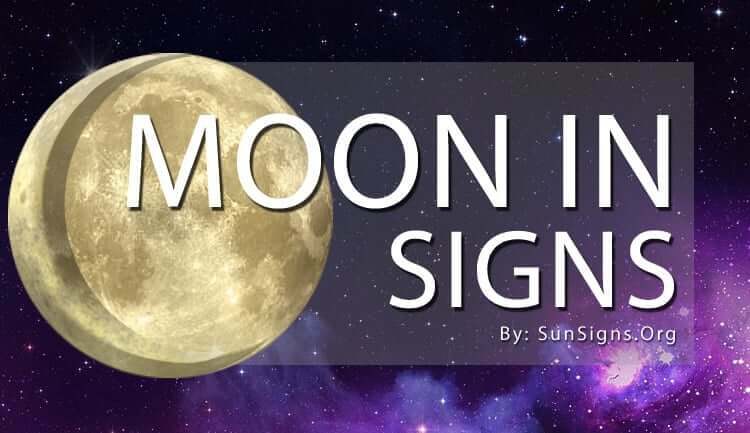 However, like any other star sign, when the moon is in this sign they will tend to be more spontaneous, wanting to do new things and start fresh. Quick actions that come with quick results will usually be what a Moon in Aries person aims for. Taurus is influenced by the Moon, but mostly when it comes to traveling. You may have a strong urge to travel for no apparent reason. You my even feel inclined to visit the beach or another body of water, when the Moon is in Taurus. Gemini, when influenced by the Moon, will be more curious than normal. They may want to start learning something new, start talking to new people, or taking short trips. Anything that will help to get a Gemini more knowledge quickly will be what they will want to do when the Moon is in their zodiac sign. Cancer is highly affected by the Moon when it comes to their career. This mostly affects people who work with water or travel by water on some sort of regular basis. These people usually love travel and adventure, and will strive to do these sorts of things during their life. Leo, usually great when it comes to social and business situations, will have an even stronger drive to succeed then the Moon is in Leo zodiac sign. Leos are more likely to take risks and think more creatively during this time, as well as act more generous. Virgo will tend to try mental exercises when the Moon is in their sign. They are more likely to try to reorganize themselves or try their hand at mental games and puzzles. Figuring out something mentally challenging, or getting a project started will help them to feel emotionally satisfied. Libra’s careers are affected by the Moon. The Moon favors Libra who work with many people. While the Moon is in this sign, Libra will have more success in their business and social lives. The Moon could also help with matters of the home. Scorpio’s emotions are heavily affected by the Moon. They may feel extremely determined to get a goal done, or they may be stuck brooding on a simple issue for hours. Their emotions will be extreme, no matter what their emotion is. Sagittarius, like Libra, have their careers influenced by the Moon. They tend to do the best when their job deals with water or dealing with water. When the moon is in their sign they will tend to do better at work as well as socializing with friends. Capricorn, usually wanting some stability in their lives, will start to search for it more when the Moon is in their star sign. They may start looking for romantic partners, careers, investments, or any number long-term, slow and steady activities. Aquarius can be heavily impacted by the moon. They will usually have a love of travel. However, do not let this keep you from home or work too often. When you are traveling, your humanitarian nature will lead you towards helping others, no matter where you are. Pisces, usually a day-dreamer, will be even more distracted when the Moon is in their sign. Luckily, this distraction won’t be all for nothing. Pisces may be more creative and imaginative with this planetary placement, coming up with great ideas and plans.